For 8 years now, Diversified Dynamics has used the San-i-tech Pink Moisturizing Soap in all of it's Restrooms. 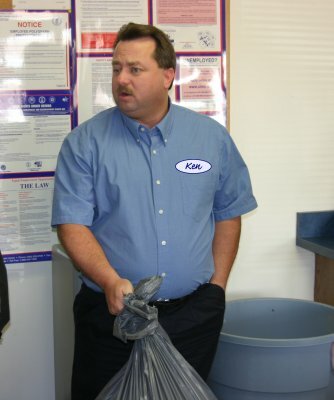 Last month after doing some detailed research, Custodian Ken Carlson made a switch. "I looked in the Allied Supply Company catalog and found out that, not only is the Dial Anti-Bacterial Green Soap $2.40 cheaper per gallon, but I can buy it in the 40 gallon cans which means I can by a pallet of 6 which qualifies us for a 4% discount!" Carlson exclaimed. DDC's Network Administrator Dave O'Brien, when asked what he thought about the change replied "uh...I hadn't really noticed".